The Ultimate Debt Manager a simple tab based user interface. Thumb nail images are presented below of each of the pages of the user interface with a sample project loaded. Please pass your mouse over, or click, on the image you wish to learn more about. From the overview tab, you can see a summary of your current financial situation, the debts needing payment this month, and the impact on your savings of these changes. From the income allocation slider, you can prioritize debt repayment over savings account funding. Under the Debt Summary heading, four items are listed. Total debt is the balance owed on all debt items in the project. Due indicates when the current payment is due. If the value is red, then you are past due and should update the debt details. Under the Cash Asset Summary heading, two items are listed. Total assets is the total balance of all cash asset accounts. The income allocation section is divided into four areas. The first area provides a description of the potential for successful recommendations for debt reduction. The second area provides you with a mechanism to prioritize debt repayment or savings contributions. As you change this value, the recommended payments and savings contributions change. The changes are also applied to the Future Analysis. It's recommended to determine a candidate contribution here, and then view the analysis to verify that the contribution doesn't create problems down the road. The third area lists all debts and indicates which debt (or debts) to apply extra payments to. The extra payment for a debt is found in the column 'Extra', and the total payment is found in the 'Payment' column. The fourth area lists all cash assets, and the amount of income to contribute to savings. In the event that no cash asset accounts are defined, it will recommend that an account be opened and the specified amount be deposited. The current financial score card provides a summary view of your overall health in the current month based on the data entered. A critical indicator of overall financial security, no elements of this value should be of grade 'C' or below. If an item is of grade 'C' or below, that indicates an area where you should focus your attention. A detailed breakdown of the expense and debt ratios can be found on the Ratios tab. The Ultimate Debt Manager provides simple way to determine the impact and optimal balance between debt repayment and savings contributions. That function is available on the Analysis tab by using the Future Analysis function. The Future Analysis function presents you with a slider that allows prioritization of debt repayment over savings contributions. While researching debt management software and strategies, you may have heard different schools of thought on how best to proceed. Regardless of the method employed, if there was no future analysis of the solution, what at first glance might appear the best option may in fact create bigger problems later on. For example, consider the analysis below. We have four debts to repay, and the analysis slider is slightly towards prioritization of savings. Note that a warning bar is displayed, and the help on that warning bar indicates that in June of 2009, the solution will require over $1400 to be withdrawn from savings. Looking at the savings balances, you'll note that the savings balance was building until June at which point a large withdrawal was required. In this example, there is a large annual expense in the form of a June vacation. Had debt repayment been a higher priority, there would be insufficient cash in the savings account to cover the vacation expenses. This would result in either an inability to pay expenses in June, an over-limit condition on the credit card used for the vacation or a requirement to split the vacation between multiple cards. Using the future analysis slider, these items can easily be determined. Obviously an additional option would be to either scale back or forego the vacation, but The Ultimate Debt Manager does not make such recommendations. Once an acceptable prioritization of debt repayment to savings contributions has been determined, pressing the Apply analysis to current month button will apply and recalculate the summary contributions. One critical component of the analysis is the Projected Score Card. The Projected Score Care looks at several key indicators of financial health and grades the candidate analysis on them. It's important to note that while ideally an 'A+' is the desired score, lower scores do not necessarily indicate serious financial problems. They may however indicate a need to be more cautious with some expenditures. For example, in the analysis above, savings is required to pay bills in one month. The user has sufficient projected savings to make that payment, and no further action is required. If the user doesn't wish to dip into savings that month, they can look at how to either increase their income, or reduce their expenses as alternate options. The ratios tab provides an overview of how your expenses and debts relate to your income in the current month. It's important to note that these ratios can exceed 100%, and if they do that indicates there is insufficient income to cover either your expenses or minimum debt payments. If the combined value is over 100%, then you will likely be dipping into savings to cover expenses. Many financial applications and debt management solutions emphasize budgeting as a means to greater financial freedom. If you are not currently using a budget, or find that these ratios are higher than you prefer, the data is broken down such that you can quickly determine the overall impact of budgetary changes. Looking at the screen shot below, there are several items worthy of note. The combined ratio is 84%. This leaves a total of 16% of income for debt reduction and savings. To determine if this will be a problem, view the analysis tab to see if any months can not be solved without requiring credit card charges, dipping into savings, or for which there is no solution. Vacation expenses are $291, and represent over 10% of the total expenses. The Ultimate Debt Manager automatically determines the amount of cash to save for one time, annual and quarterly expenses. Effectively this builds an "escrow" model into the solution to ensure that these infrequent items do not overwhelm you. Three credit card debts are listed, with Discover having the largest minimum payment. Given the relative size of the minimum payment, it is likely that this card has the highest balance and interest rate. If possible, this would be a good candidate to contact and attempt to reduce (even temporarily) the interest rate. 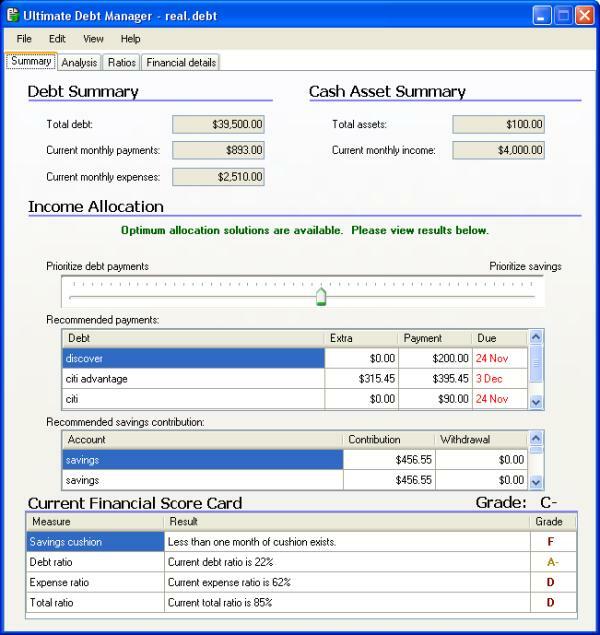 The financial details tab displays summary information on each of the four financial statistics used by The Ultimate Debt Manager. From this page, you can add, modify or delete entries. Changes made here are immediately reflected in the recommendations and analysis. Project files contain four distinct data types. Income sources are where the funds you have to pay expenses and debts come from. For most people, this will be your job, or jobs. Income from cash assets (e.g. savings accounts) should not be specified here, but income from other investments should. Cash Assets are literally what they sound, places where you have cash assets stored for ready access. Included in this category are checking accounts, and other accounts from which you might draw funds from. Debts are any account where you are paying some amount of money over time rather than the entire amount owed in a single payment. Credit cards, mortgages and car loans are common examples of this type of information. If the due date is in red, this indicates a past due account and you will want to update the debt information. Expenses are any item which is paid at the time the bill is due, the product purchased or the service rendered. Rent, groceries and phone bills are good examples of expenses.